Kenny Smaron, a Philadelphia native poker player has won the €10,300 High Roller title at European poker tour Prague. The event attracted 315 entries and generated a cash pool prize of €3,150,000. Smaron wins the title of the event and collected a very cool €595,500 of cash prize. This is the largest live cash win by Smaron as well. Smaron love to play high stakes poker games such as 6 max sin n goes at online poker sites. He is taking his chances at online and winning real good amount of money. Kenny Smaron was very happy indeed after winning the single largest live cash at EPT Prague. He was very pleased and said that finally it is my time to celebrate. Some of the top players like Aleksandr Denisov got 11 places and collected €51,330, Mihails Morozovs completed for 12th place and got a cash prize of €45,220 and William Foxen got 14th position and earned a cash of €40,640 at European poker tour Prague. These were the players got eliminated since the game began at the second day. The event €10,300 High Roller was one of the most successful poker event at EPT Prague and it was decided very soon as the game began to play. This is a brilliant win by Smaron because he is going to celebrate his 31st birthday, this Christmas. 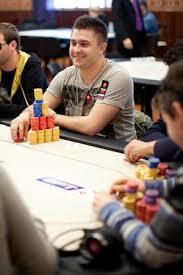 He is one of the best online poker players in the world these days and play at different portals including pokerstars.